This article was published in the Geelong Advertiser on Friday 1 February 2019. Photo by Peter Ristevski, published in the Geelong Advertiser. 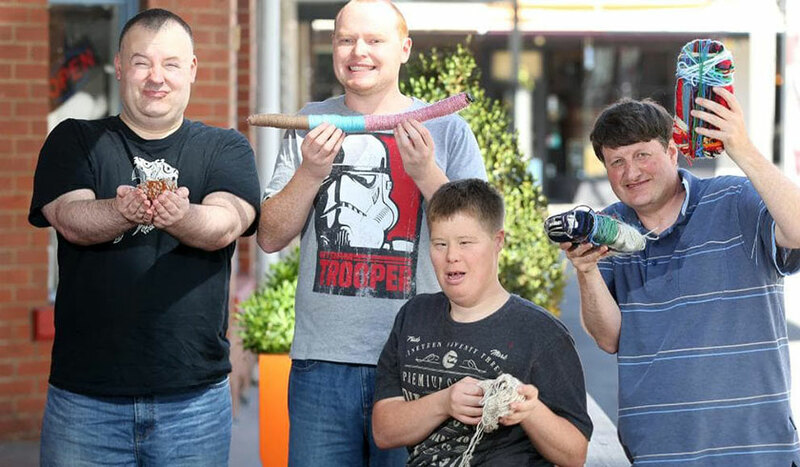 A new participatory wrap art initiative by the Disability Services Commissioner is putting the thoughts, feelings and rights of people with disability at the centre of all conversations. “The together project is about bringing people together, and starting important conversations about safety and respect between people with disability, family members, friends and people who work in disability services”, says Marianna Codognotto from the Disability Services Commissioner. The National Wool Museum has been supporting the together project with workshops for people to do wrap art. Wrap art is very equalising as there’s no wrong or right way to do it. The Museum encourages everyone to get involved and make their own wrap art. The together project will have a residency in the Nebula at Steampacket Gardens on the Geelong waterfront on 4 and 5 February. The Nebula is a fully-accessible portable arts space and will be open to the public between 10am – 4pm. “Everyone has the opportunity to come and contribute to our wrap art project and to join in our conversations around what makes us all feel safe, happy and respected,” says Ms. Codognotto. Completed artworks from the together project, the National Wool Museum workshops, and the Nebula art residency will be displayed at The Project Space at Deakin University in Geelong in an art exhibition from 4 to12 February. The National Wool Museum and ArtGusto will be running an open workshop at The Project Space from 11am – 1pm on 4 February. All participants will be contributing towards a collective work. To get involved with the together project and create your own wrap art, visit www.odsc.vic.gov.au/togetherproject.